For those who are short of space in the cockpit, but still don’t want to do without a good kneeboard, then this is ideal for you. Despite its size our smallest kneeboard has all the features of its bigger brother. Starting with the wide Velcro tape fixing, anti-slip pads to the stable holding clip and socket for a stop watch or the PILOT CONTROLLER® KIT. 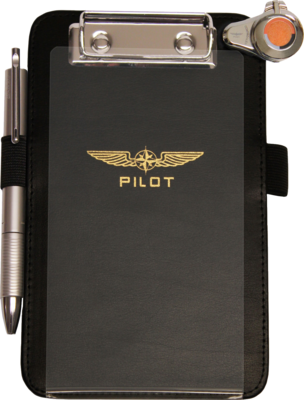 Whether you are a glider, a helicopter or a light aircraft pilot, you can make good use of this “Piccolo”. Also useful for fixing PDAs and GPS.